This high-quality retractable block eraser is a clean, efficient eraser made from a soft white material that is non-abrasive and dust-free. Perfect for getting into corners or erasing large areas quickly, it erases graphite marks cleanly without scratching, tearing, or smudging — all with a minimum of pressure. 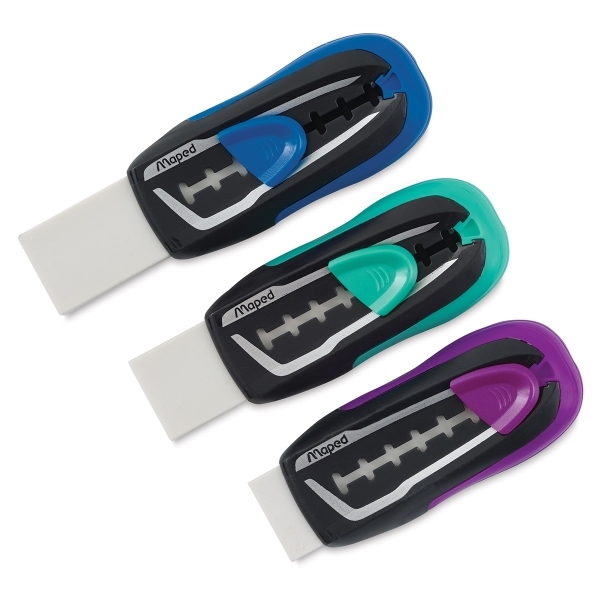 Use the Maped Advanced Universal Retractable Eraser on paper, vellum, and drafting film. The ergonomic case locks into place when extending and retracting the eraser, and the eraser residue rolls into one neat piece. This eco-friendly eraser is free of PVC, latex, and phthalates.